Ultimate guide to digital painting like a PRO II. 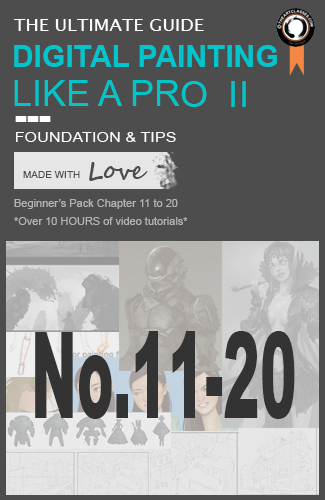 Digital painting tutorial: Beginner's package chapter 11. You will learn to create 4 different scenes using 3 different POV. You will learn how to use point of view (POV) to enhance your perspective. You will learn to utilize one point perspective in three different POVs. You will get the right foundation to perspective in creating environment concept. You will learn to proficiently work with layers mode to create depth of field. You will learn to use very useful and complex adjustment layer Functions to excel your art work. Digital painting tutorial: Beginner's package chapter 12. YYou will learn to create 4 different scenes using two and three points perspective. You will learn how to use three types of point of view (POV) to enhance your perspective. You will learn to utilize perspective in three different POVs. Digital painting tutorial: Beginner's package chapter 13. This video tutorial will show you the easiest and the most logical way to render organic surfaces using applied geometry forms. Basic painting block in/render geometry forms. You will learn to block in or render any figure or object with box system. You will learn how to find where to put light and shadow on geometry objects. You will learn the most logical way to paint and render. Digital painting tutorial: Beginner's package chapter 14. You will learn to create 28 different facial expressions. You will learn to paint 5 different facial expressions from one face. Digital painting tutorial: Beginner's package chapter 15. You will learn to draw 18 different angles of hands and fists. You will learn to paint 8 different positions of hands and fists. You will learn to use very useful and complex adjustment layer Functions to excel your artwork. Digital painting tutorial: Beginner's package chapter 16. Learn to create a form using default soft and hard round brushes. Understanding how edges work on forms. Learn to use painterly textures in a simple form. Learn to utilize texture brushes on a more complex form. Learn to differentiate types of texture brushes. Digital painting tutorial: Beginner's package chapter 17. Learn to use three basic geometry shapes to create concept art and design. This video tutorial will show you the easiest and the most logical way to utilize basic geometry shapes into concept design. If you have a difficult time coming up with cool design either character or creature, this tutorial will definitely help you. You will learn about the relationship between lines and shapes. You will learn how to create complex shapes using three basic geometries. You will learn to see multiple 3d forms from just one 2d shapes. You will learn to take advantage of looking at object from different viewpoints. Digital painting tutorial: Beginner's package chapter 18. Learn to create forms from your simple shapes from previous chapter. You will learn about the relationship between lines, shapes, and forms. This video tutorial will show you the easiest way to turn basic shapes into forms..
You will learn how to create forms from complex shapes using basic lighting. Digital painting tutorial: Beginner's package chapter 19. 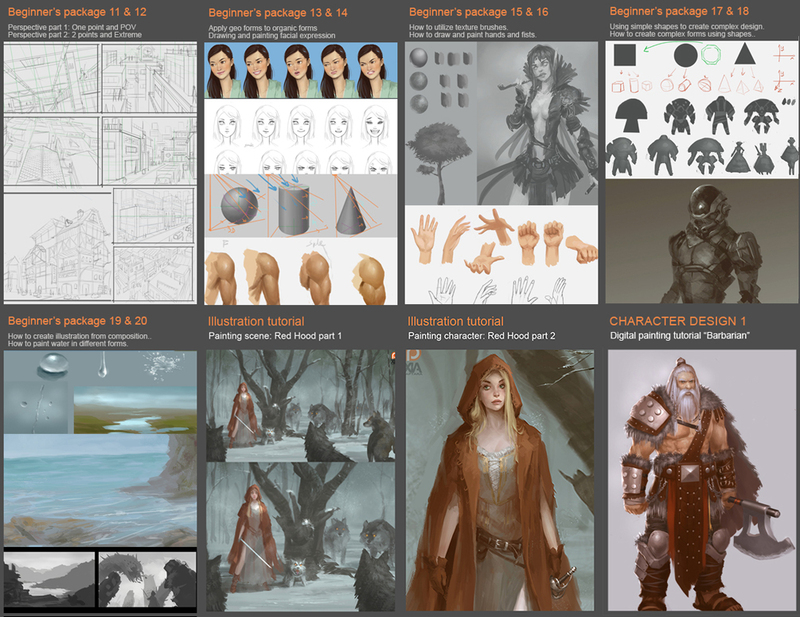 Understanding how composition fits into your illustration workflow. You will learn to use three value sets to create depth of field for scene. You will learn use rule of third to compose your scene. You will learn the easy ways deal with three perspective types. You will learn to use selection tools and texture brushes to further develop your digital painting skill. Digital painting tutorial: Beginner's package chapter 20. You will learn about water property as a material in digital painting. You will learn to paint the different types of water. You will learn to paint regular water drop. You will learn to paint water splash and water on a glass surface. You will learn to paint water in small pond and lake situation. You will learn to paint water on the ocean surface. BONUS video tutorial 1: Redhood vs wolves. You will learn how to quickly get your idea into a painting. You will learn the quick way to create composition and illustration. You will learn to arrange value to create depth in your artwork. You will learn to create a sense of scale in your artwork. BONUS video tutorial 2: Redhood. ou will learn how to use light to create form. You will learn how to utilize different custom brushes. BONUS video tutorial 3: barbarian warrior. You will learn to paint hair character concept in depth within hours. You will learn to paint different kind of materials on the character.